We found 920 results matching your criteria. In today's ever changing economic environment, ongoing training of your employees and clients is an essential aspect of business success and growth. When managing your meetings and business training sessions you need to be confident the configuration of your tables is correct, and that the quality of the tables you purchase is sound. 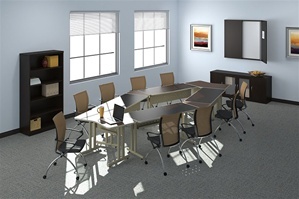 Once you have determined the requirements of your training sessions or meetings, along with the number of attendees, you can select the right table configurations to put in your training center and meeting rooms. 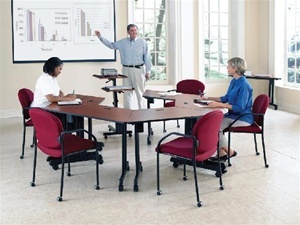 If your meetings or training sessions require group interactions where members need to participate or work in teams, then U-shaped tables will best meet this requirement. Rectangular tables will be better for conferences where your audience or group participation is limited. If you have a confined space and need to get creative with your room layout, then corner tables and trapezoid training tables are best. Whatever your training table or meeting table needs are, we are confident the quality and value of our training tables and ongoing service will exceed your expectations. Education today requires technology, so the New Medley Series of computer tables features three wire-management solutions for students and teachers. Each table has itÍs own unique method of handling cords and cables neatly and efficiently. There is no reason for corporate and educational settings to be static and dull. With the Applause series from OFS Brands graceful aesthetics and forward-looking design are constructed from the best materials, creating an adaptable table solution for any setting. Mayline Cohere Training Tables: When the image of your meeting room reflects the high standards of your business, select Cohere. Blending contemporary design with uncompromising durability, Cohere style and construction will adhere to your meeting and training environments. Mayline Flip-N-Go Training Tables: When the image of your meeting room reflects the high standards of your business, select Flip-N-Go. 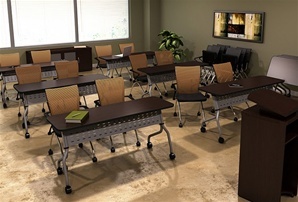 Blending contemporary design with uncompromising durability, Flip-N-Go style and construction will adhere to your meeting and training environments. Mayline Meeting Plus Tables: When the image of your meeting room reflects the high standards of your business, select Meeting Plus. Blending contemporary design with uncompromising durability, Meeting Plus style and construction will adhere to your meeting and training environments. Get in Sync with the perfect balance between style and function! Single-handed center control mechanism for convenient flip of the top; easily convert from use to storage. Integrated modesty panel with built-in cable management. Mayline T-Mate Tables provide great functionality and help you save your budget. The freestanding table and the shared-leg design saves cost and provides more knee space. OFM Modular Training Tables are modern looking and incredibly strong. The individual units go together in multiple configurations in a snap with no tools required. They feature scratch-resistant powder-coat finish on a durable steel base and frame. OFM's versatile trapezoid shape modular tables create multiple work environments within the same room. Place the tables according to your needs, conference style, training room, one to one meetings, or let your imagination run wild. Tables ship with locking dual wheel carpet casters for easy configuring, thermofused melamine top, wire management table top grommet, and sturdy 16 gauge steel powder coated painted legs. No tools required for assembly. 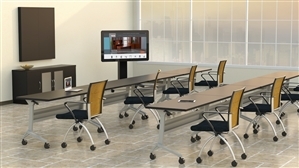 Regency's Fusion training tables create multiple work environments within the same room. Place the tables according to your needs, conference style, training room, one to one meetings, or let your imagination run wild. 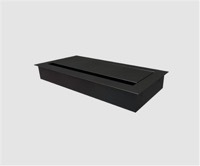 Tables are available with four wheel casters for easy configuring, thermofused melamine top. 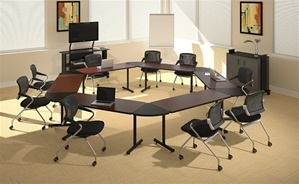 Regency's versatile modular tables create multiple work environments within the same room. Place the tables according to your needs, conference style, training room, one to one meetings, or let your imagination run wild. Tables ship with locking dual wheel carpet casters for easy configuring, thermofused melamine top, and sturdy 16 gauge steel powder coated painted legs. Watson Seven Flip-Top Training Tables - A relentlessly simple way to organize highly flexible meeting and training spaces. 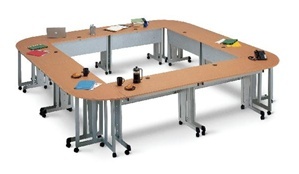 We do things differently than our competitors - we build training tables that are more robust. We consider the user and their environment then challenge the limits for what is expected and accepted as the quality standard within the industry. Clarus Glass White Boards provide a visually striking design element to workspaces ranging from conference rooms to executive offices. Their non-staining writing surface delivers a rich and vibrant backdrop ideal for that critical presentation. Clarus Glassboard - go! Mobile 43" x 73"
Presenting an open and shut case for good business: The next generation of flexible desktop power and data solutions for multi-media conference room settings. These retractable PME15 convenience outlets are designed with a lid that function as cable management portal that can be closed while in use. Presenting an open and shut case for good business: The next generation of flexible desktop power and data solutions for multi-media conference room settings. These retractable PME22 convenience outlets are designed with a lid that function as cable management portal that can be closed while in use. Presenting an open and shut case for good business: The next generation of flexible desktop power and data solutions for multi-media conference room settings. These retractable PME24 convenience outlets are designed with a lid that function as cable management portal that can be closed while in use. Presenting an open and shut case for good business: The next generation of flexible desktop power and data solutions for multi-media conference room settings. 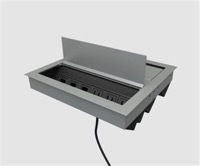 These retractable PME33 convenience outlets are designed with a lid that function as cable management portal that can be closed while in use. Presenting an open and shut case for good business: The next generation of flexible desktop power and data solutions for multi-media conference room settings. These retractable PME53 convenience outlets are designed with a lid that function as cable management portal that can be closed while in use. Look what's popping now: The next generation of flexible desktop power and data solutions for executive and institutional work station applications. Retractable and durably constructed, These Modular High Output convenience modules are highly functional with a fluid one touch door that remains open during use. The table top Power Communication Center provides two simplexes to accept standard power cords or AC adapters and provides two ports opening for the installation of voice/data modules. 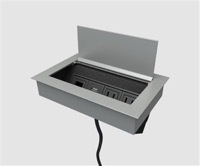 The Retractable Power Communication Center provides two simplexes to accept standard power cords or AC adapters and provides one modular furniture opening for the installation of voice/data. The Retractable Data Communication Center provides adapters and one modular furniture opening for the installation of voice/data. Presenting an open and shut case for good business: The next generation of flexible desktop power and data solutions for multi-media conference room settings. These wire management grommets are designed with a lid that function as cable management portal that can be closed while in use. Mayline - Flip & Nest Tables - Half Round - 24" x 48"
Mayline - Flip & Nest Tables - Half Round - 30" x 60"
Fixed leg training tables offer flexibility and durability in a clean contemporary design. Modesty panels connect to legs for added strength and come standard with new cable management features. Multiple sizes and shapes. Seating on both sides without panel. Support products, such as the Presentation Cart, A/V Stand, and Hospitality Cart, complement any meeting or training environment. Mayline Cohere - Fixed Height Training Table - 18" x 48"
Mayline Cohere training tables are an ideal solution for training rooms, classrooms, and other applications that may require frequent reconfiguration. Locking casters and optional ganging hardware provide stability but can be easily disengaged when tables need to be moved. Mayline Cohere - Fixed Height Training Table - 18" x 60"
Mayline Cohere - Fixed Height Training Table - 18" x 72"
Mayline Cohere - Fixed Height Training Table - 24" x 36"
Mayline Cohere - Fixed Height Training Table - 24" x 42"
Mayline Cohere - Fixed Height Training Table - 24" x 48"
Mayline Cohere - Fixed Height Training Table - 24" x 54"
Mayline Cohere - Fixed Height Training Table - 24" x 60"
Mayline Cohere - Fixed Height Training Table - 24" x 66"
Mayline Cohere - Fixed Height Training Table - 24" x 72"
Mayline Cohere - Fixed Height Training Table - 30" x 36"
Mayline Cohere - Fixed Height Training Table - 30" x 42"
Mayline Cohere - Fixed Height Training Table - 30" x 48"
Mayline Cohere - Fixed Height Training Table - 30" x 54"
Mayline Cohere - Fixed Height Training Table - 48" x 24"
Mayline Cohere - Fixed Height Training Table - 48" x 30"
Mayline Cohere - Fixed Height Training Table - 48" x 36"
Mayline Cohere - Fixed Height Training Table - 60" x 30"
Mayline Cohere - Fixed Height Training Table - 60" x 36"